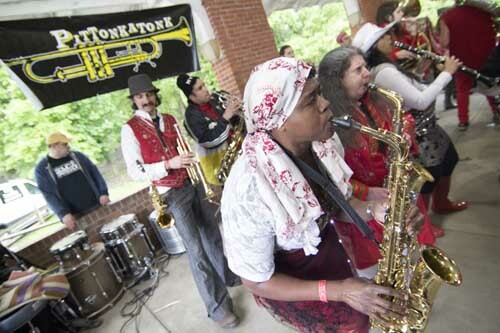 Pittonkatonk promotes social and environmental justice through music, culture, and education. 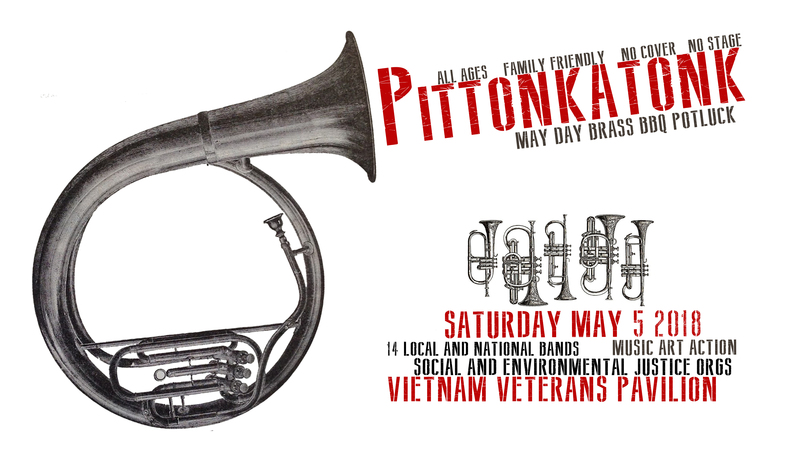 Pittonkatonk established itself as a free community event in 2014 by inviting local and national community brass bands, world music performers, and activists to convene in a May Day celebration. 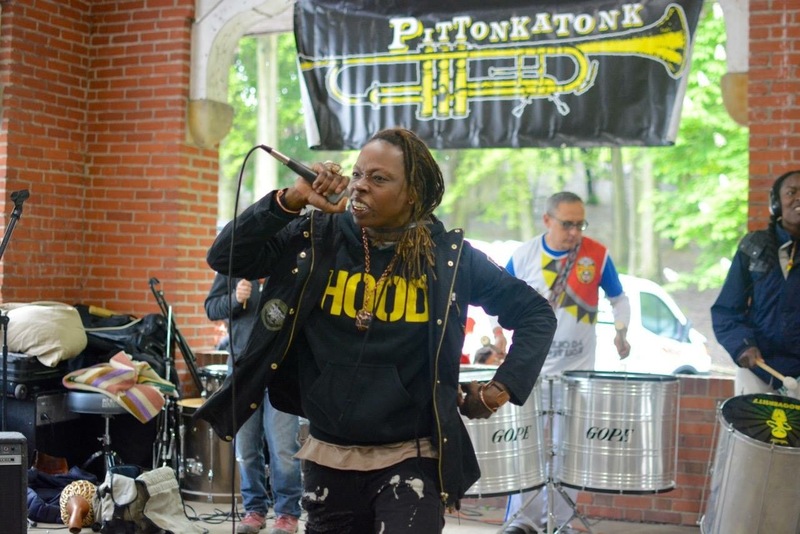 Pittonkatonk is a grass-roots, volunteer-run social and environmental justice organization that promotes creativity and critical thought by way of music making and participatory events in and around the Pittsburgh Area. 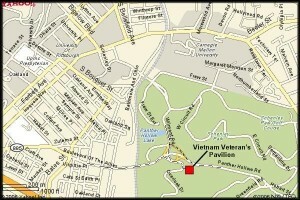 The annual Brass BBQ held in early May at the Vietnam Veterans Pavilion in Schenley Park. Pittonkatonk encourages participants to engage in making the event happen through..
Pittonkatonk is a space of engagement. 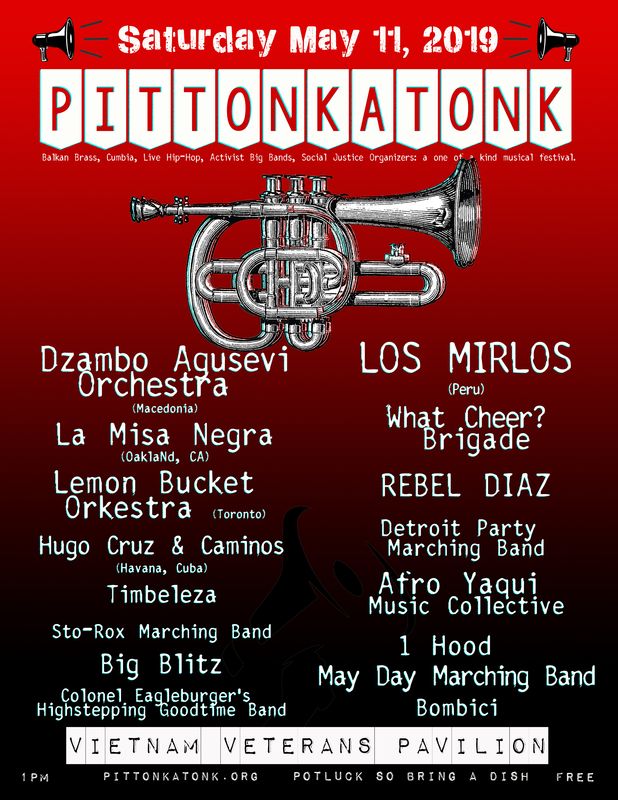 Pittonkatonk is music without boundaries. 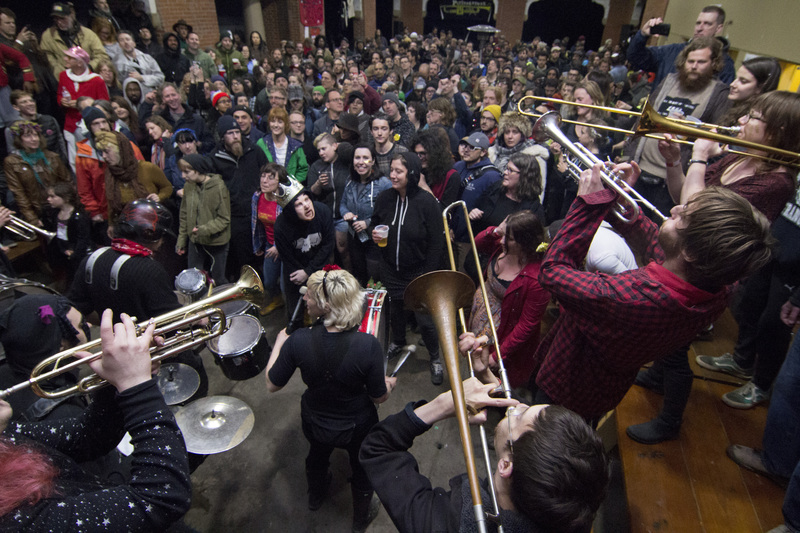 Since 2014, Pittonkatonk is music in public spaces that belong to everyone, with no stage, no doors, and no right way to express yourself. There is no admission fee and no corporate sponsors. 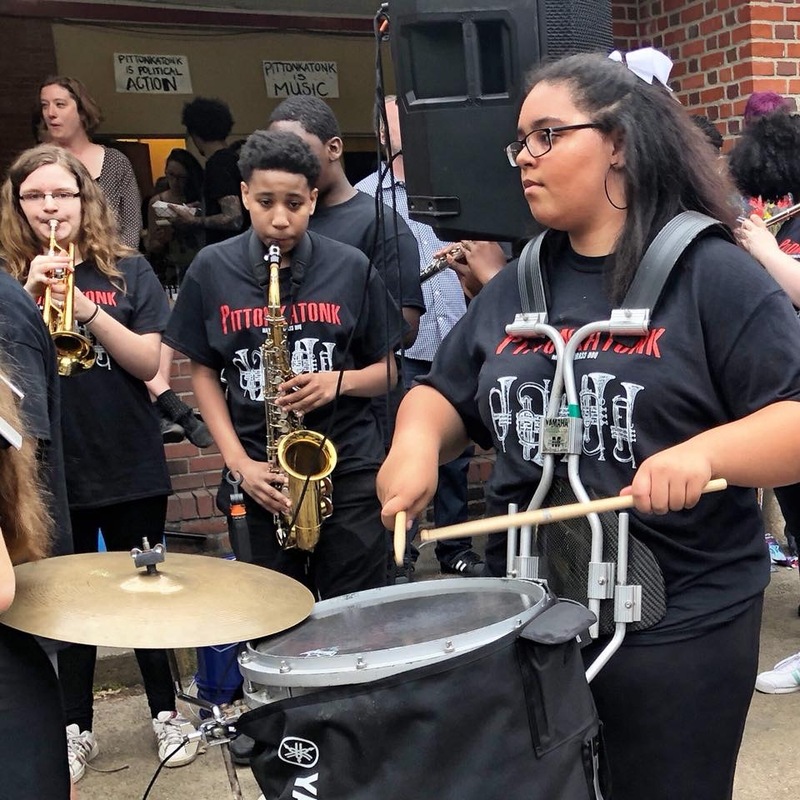 It is a potluck event where people bring food, drink, music, dancing, and the desire to come together to celebrate what music and community really can be. 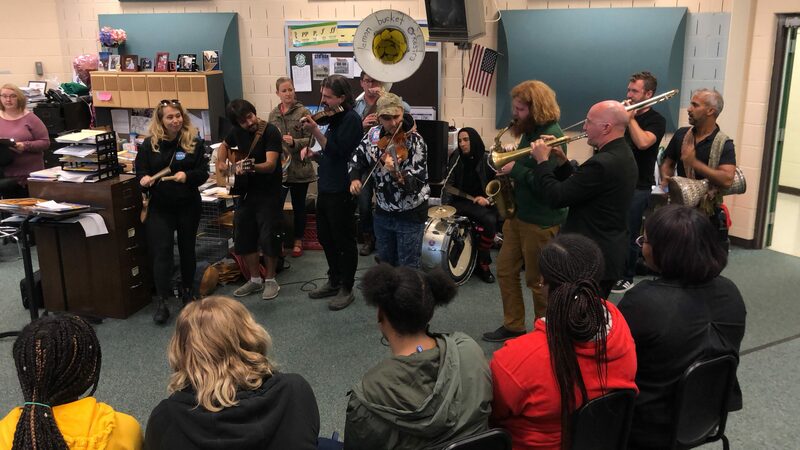 We connect people with national and local musicians, activists, and educators in order to empower them to use their love of music to engage the world around them. 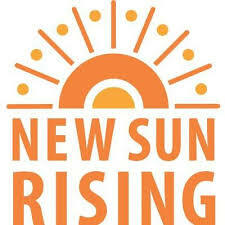 Our mission is to promote music performance as a means of achieving positive personal, social, and political outcomes. 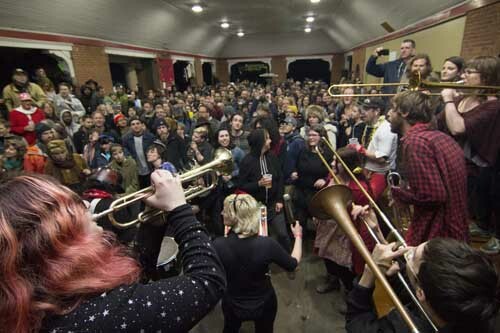 To achieve this we create events that engender purposeful music making on a communal level, blurring the lines between performer and spectator, entertainment and activism. 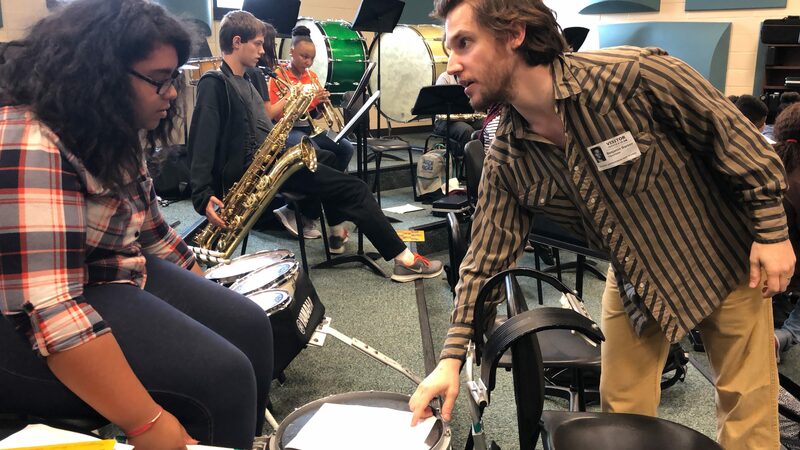 We work with adults and teens from Pittsburgh to create public performance opportunities designed to give a voice vulnerable people in our city. 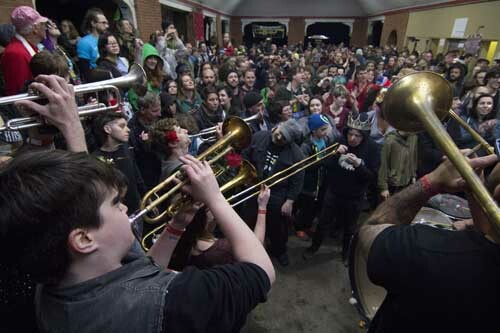 Our goal is create a musical space for everyone, regardless of age, race, gender, class, or religion. Pittonkatonk brings together bands ranging from Balkan brass to activist marching bands, samba to New Orleans swing. How about a house show for the whole city? How about a family reunion with 2000 people you’ve never met? 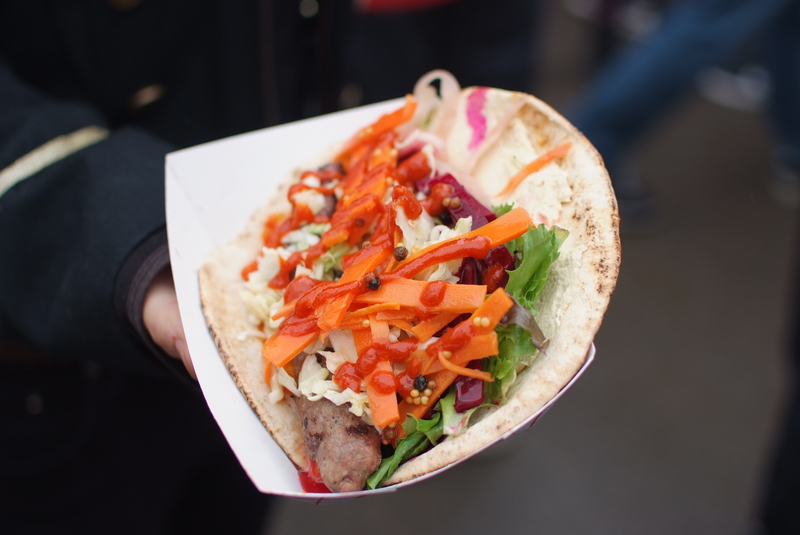 How about a neighborhood party with 90 neighborhoods? That’s what we’re about. Pittonkatonk works because we make a call to action and, for the past three years, the community has answered. This year, we want to join forces with you again to make our city more inclusive, progressive, and welcoming. 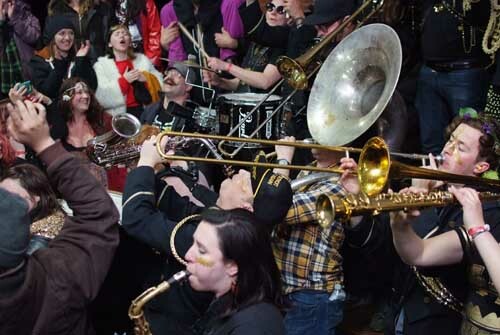 Džambo Aguševi Orchestra is a brass band from Macedonia virtuously performing a music that might be defined as fusion of traditional Balkan, Gypsy and Turkish music influenced by swing, jazz and pop and film music, today considered as one of top Balkan brass bands. The famous “Dragacevski Sabor” in Guca, Serbia (also known as “Golden Triumpet competition”) is since the sixties the most important event of this kind in the whole region and probably in the world. At the World competition in summer of 2011, The Aguševi Orchestra received the first prize and Džambo wrote his name in the history of this famous event: both the judges and the audience appraised the Orchestra and its young leader. Los Mirlos (Peru) The iconic band is well known for the incredible productions of psychedelic Peruvian Cumbia that they have produced since the 70’s. Widely known as the mastermind of the Peruvian-Amazonian Cumbia, they are back to the musical scene to share with the world the Peruvian musical history and the value of it. Rebel Diaz – Somos hijos de political refugees from Chile who fled a CIA-funded dictatorship in the 1970s. Revolution raised us, and the culture of Hip-Hop provided us our own Nueva Cancion. We’ve been doing rebel rap since the Clinton era, sharing our story and those of our people; el barrio, the hood, the poor, los inmigrantes. Our bilingual sound has been shaped by pieces of South American folk, house, and latin percussion gettin down with boom-bap breaks and 808s. 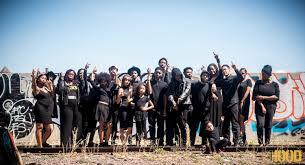 1HOOD MEDIA IS A COLLECTIVE OF SOCIALLY CONSCIOUS ARTISTS AND ACTIVISTS, WHO BELIEVE THAT ART IS THE BEST WAY TO CHALLENGE INEQUITY, RAISE AWARENESS AND UNIFY HUMANITY. 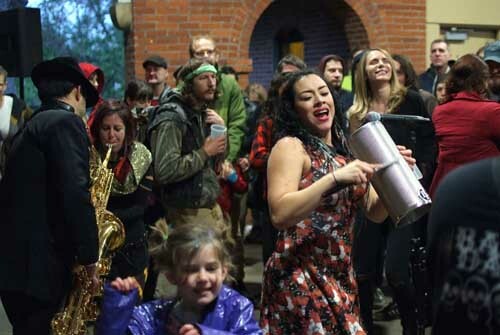 La Misa Negra is a 7-piece band from Oakland, California, known for their unique blend of heavyweight cumbia and high-energy, Afro-Latin music. 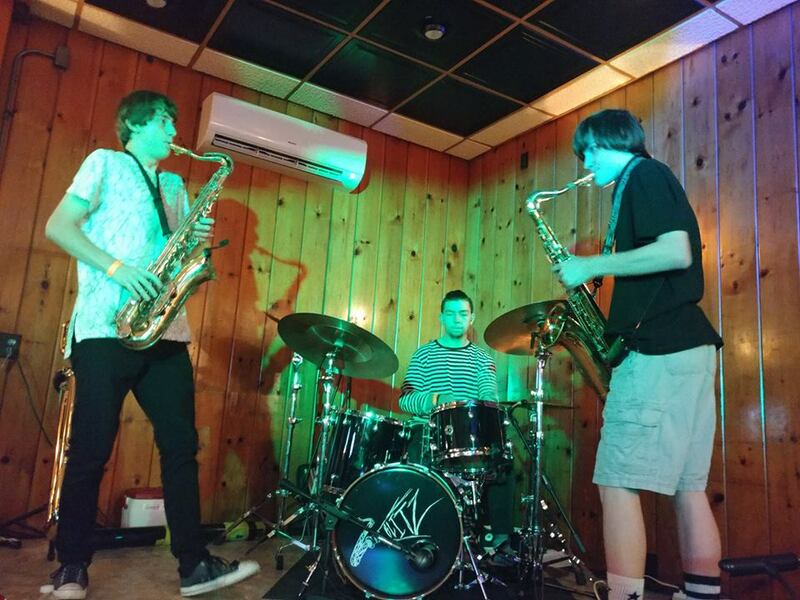 On stage, they deliver an electrifying performance that explodes with infectious dance grooves and punk rock energy, powered by horn and accordion-driven riffs, a fierce rhythm section, and a vintage-inspired sound. On the strength of their wild and one-of-a-kind shows, they have gained a reputation as one of the most exciting live bands to emerge from the Bay Area in recent years, garnering a diverse fan base that transcends musical, cultural, and generational divides. 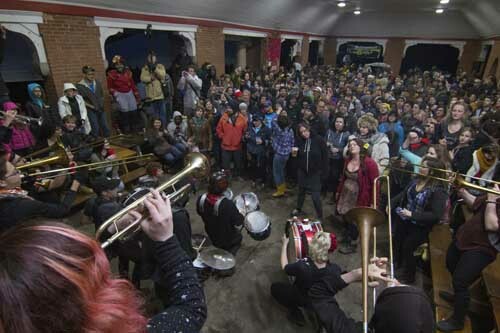 Lemon Bucket Orkestra is a guerilla-punk-balkan-folk-brass band massive like no other. 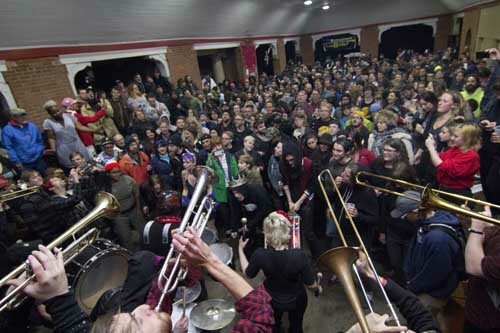 Tracing their genesis back to the streets of Toronto, the original quartet of busking troubadours quickly amassed a battalion of like-minded musical souls and the full-blown, dozen plus strong Orkestra was born. 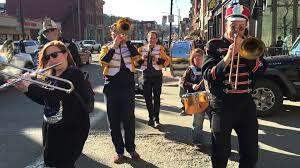 Colonel Eagleburger’s Highstepping Goodtime Band Pittsburgh’s very own Highstepping band found at rallies, parties, community events, and anywhere a brass band is needed. Afro – Yaqui Music Collective Named after the indigneous music of Gizel’s people, the Yaqui of northern Mexico, the band fuses music from music of first nations in the Americas with the funk, jazz, and hip hop to create a new rhythm that liberates spirit and soul. Culture and politics are one circle of human life that reflect and reinforce each other. 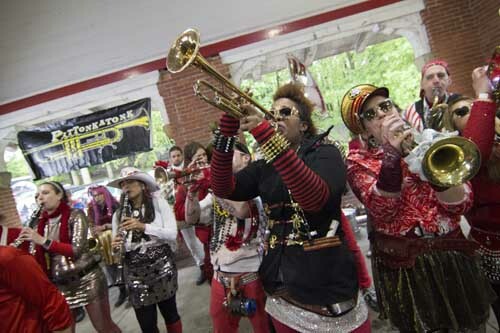 Therefore, any meaningful revolutionary process will have music and the arts at its fuel and its forcefield. As we enter a world on the brink of social and environmental disintegration, our task is nothing less than a total transformation of values that builds a world beyond capitalism. 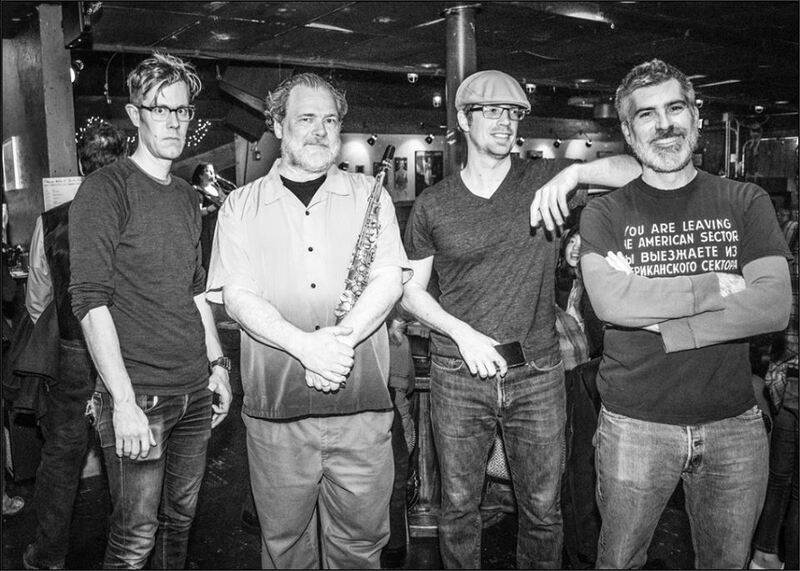 Big Blitz is a Pittsburgh based band that was born from the sounds of dance, rock, and jazz improvisation. Bombici Pittsburgh’s premier avant-garde, electro-acoustic post-punk, no-wave Balkan music ensemble. 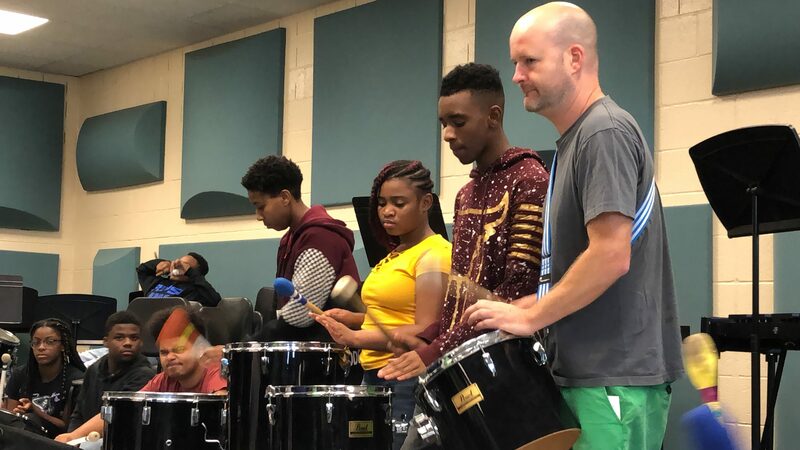 Timbeleza is a volunteer-run not-for-profit collective that recruits, teaches, and mentors members in instrumentation, rhythms, and movement. We work closely with master drummers, continually striving to expand our repertoire and gain new fans. 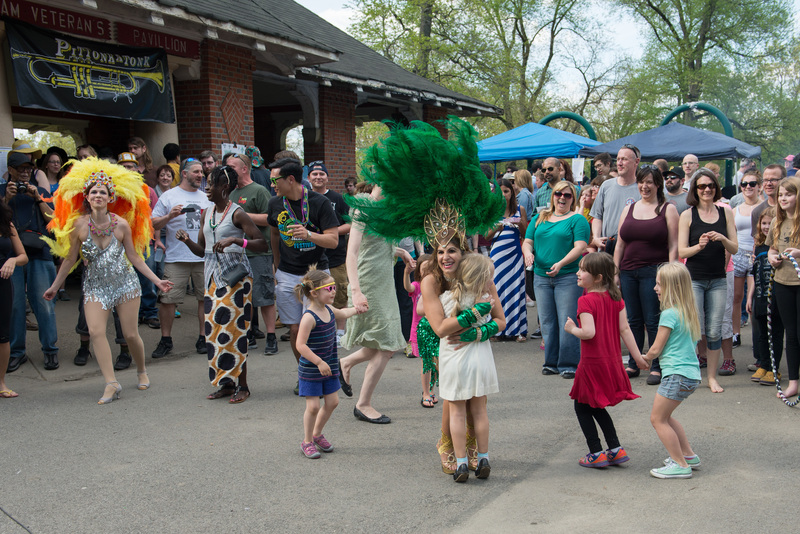 Our goal is to expose people to samba and invigorate the community with our music and performance style. Abafasi, meaning many women, was founded in 2006 by Kelly E. Parker and is a collective group of “wimmin” devoted to breaking through barriers, raising consciousness, and making a joyful noise. 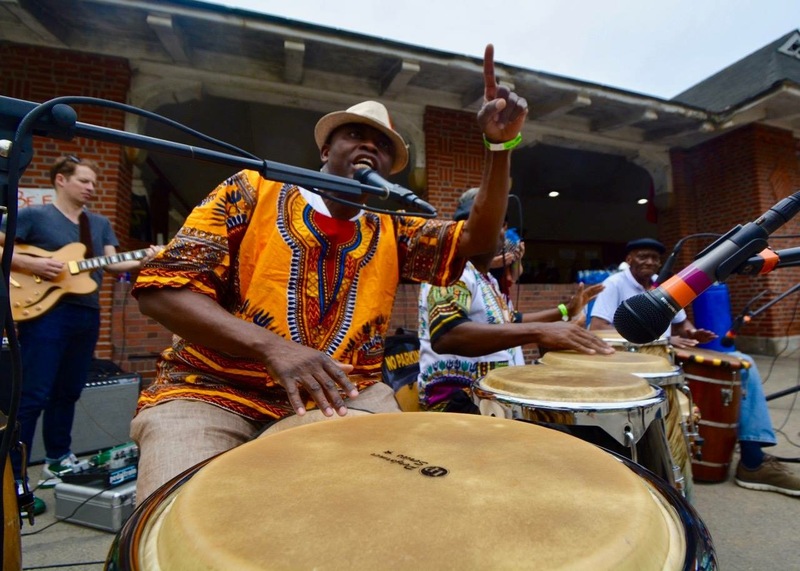 Their music is rooted in West African rhythms with an African-American flavor. What is the Artivist Greenhouse? 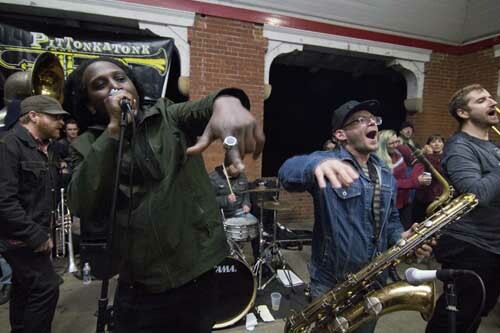 This year Pittonkatonk will commission three Pittsburgh artists to write new songs in collaboration with social justice organizers called The Social Impact Experience. 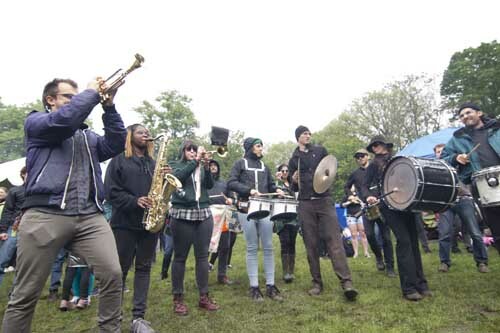 The project encourages artists to form deep working relationships with environmental and social justice organizations that work to clean our air and water, support immigrants and prevent displacement, will partner with musicians to get their message out in creative ways. 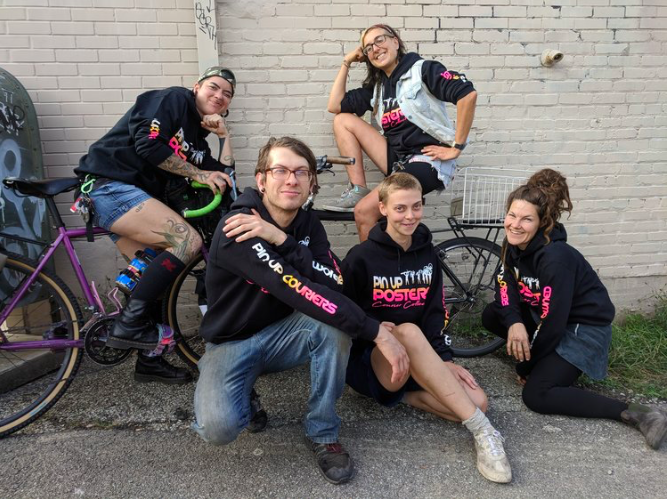 The songs will live on after their premiere at the May Day BBQ helping these organizationsNew collaborative works will premiere at the 2019 Pittonkatonk May Day Picnic on May 11. We are excited to introduce the Activist Greenhouse (Resource Tent) as part of our May Day Celebration. 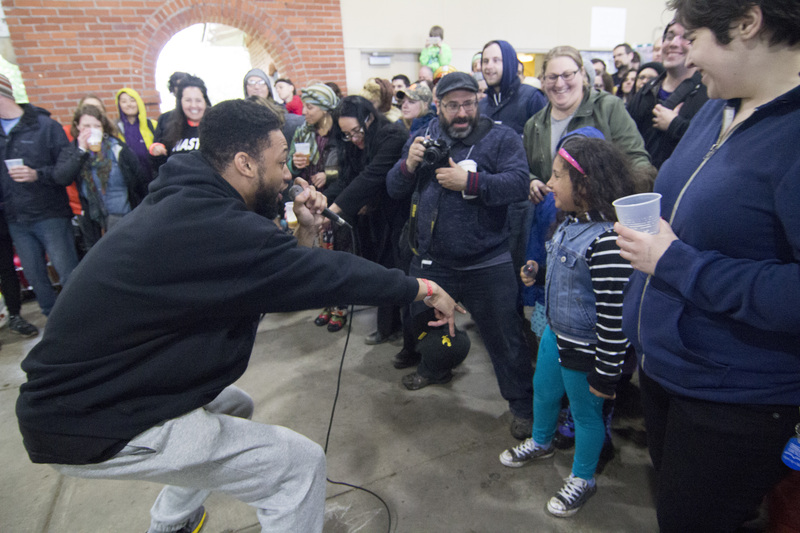 The natural progression from working with activist bands from around the country (and world) is to include the organizations working in the fields of social and environmental justice. We feel it’s time we celebrate the hard work of these organizations and activists working for equality. 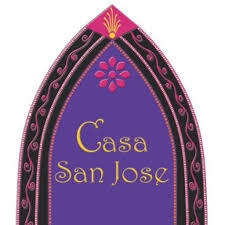 This center was opened to support the ongoing and important work of Sister Janice Vanderneck, who has worked with the Latino community in the Pittsburgh region for many, many years. She has devoted herself to helping Latinos navigate the health system, social services, and the legal system to survive and to thrive in this community. More than 1,000 Latinos have benefited from her support over the years. 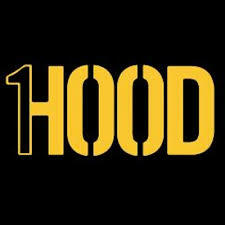 1Hood Media is a collective of socially conscious artists and activists who utilize art as a means of raising awareness about social justice matters effecting people around the world. 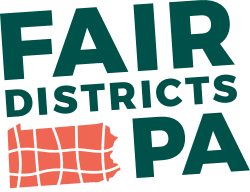 Fair Districts PA is a nonpartisan, citizen-led, statewide coalition working to create a process for redistricting that is transparent, impartial, and fair. City of Asylum creates a thriving community for writers, readers, and neighbors by providing sanctuary to endangered literary writers, so that they can continue to write and their voices are not silenced. 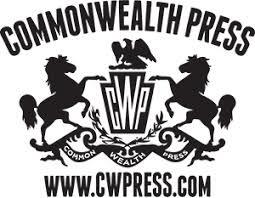 COA has hosted writers from China, Iran, Myanmar/Burma, Venezuela, El Salvador, Bangladesh, Syria, and Brazil. COA Pittsburgh is also the national headquarters for ICORN, The International Cities of Refuge Network based in Norway. COA works closely with ICORN in their common mission to provide shelter to writers and artists at risk, and to defend and advance freedom of expression locally and internationally. 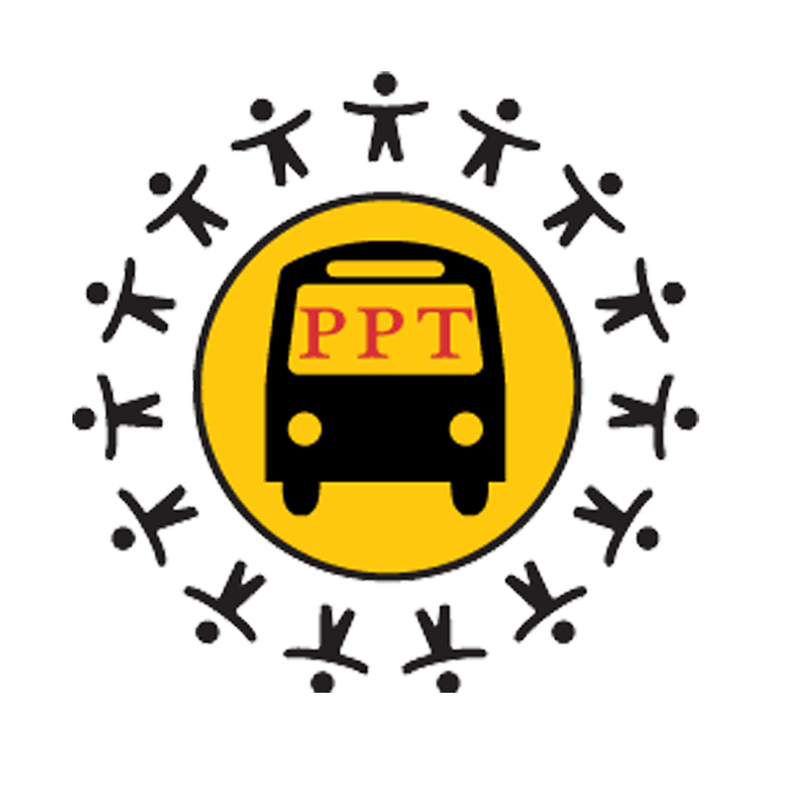 PITTSBURGHERS FOR PUBLIC TRANSIT is a grassroots organization of transit riders, workers, and residents who defend and expand public transit. We keep the public in public transit by mobilizing communities to advocate for equitable, affordable, and sustainable transportation systems. We work together to win the Transit Bill of Rights for all residents of Allegheny County. 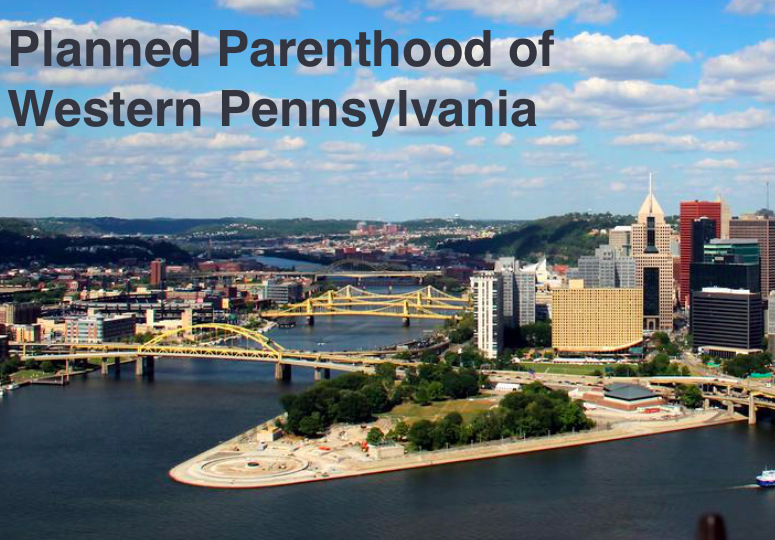 The mission of Planned Parenthood of Western PA (PPWP) is to provide comprehensive and complementary health care to those in need of services; disseminate information about human sexuality and the need for family planning and responsible parenthood; and advocate public policies which guarantee these rights and ensure access to such services. Making sure working families share in the prosperity of a New Pittsburgh. Pittsburgh United is a coalition of community, labor, faith, and environmental organizations committed to advancing the vision of a community and economy that work for all people.We aspire to create a new social contract, whereby all workers are able to care for themselves and raise their families, sharing in the prosperity generated by economic growth and development. Repair the World’s signature program, Repair the World Communities, engages young adults in social change around education and food justice in neighborhoods in Baltimore, Detroit, Philadelphia, Pittsburgh, and New York City. In most communities, a City Director supports a cohort of fellows (ages 21-26) who make a year-long service commitment to Repair the World. During this year, Repair’s fellows work closely with local nonprofits to create authentic and impactful volunteering and education opportunities—and they use peer-to-peer outreach and recruitment to engage thousands of other young adults in volunteering and learning. 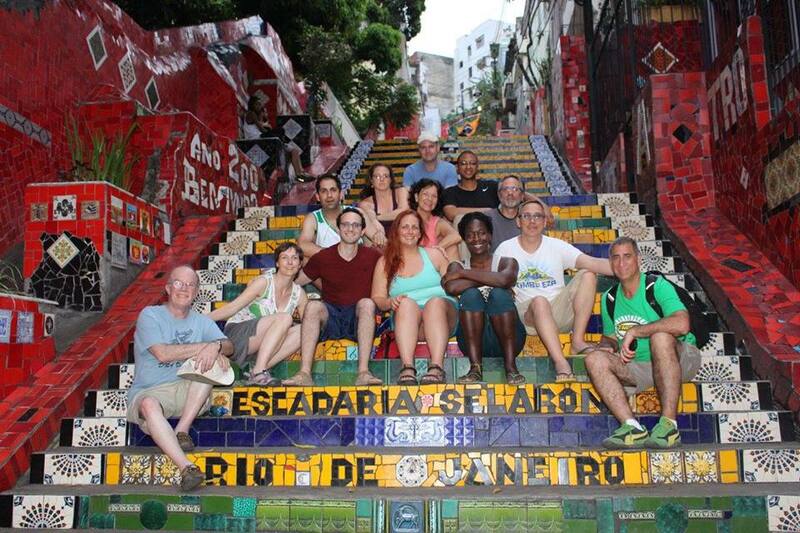 Latin American Cultural Union Mission is to promote, preserve and enrich the Latin American culture, while unifying the Latino community and bridging with other communities within the Greater Pittsburgh Area. 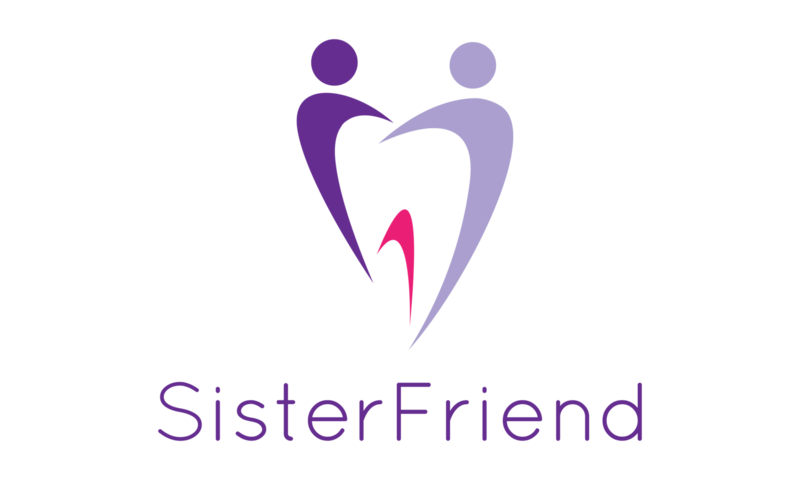 Pittonkatonk hosts a toiletry drive each year for SisterFriend. Please bring an item to donate. 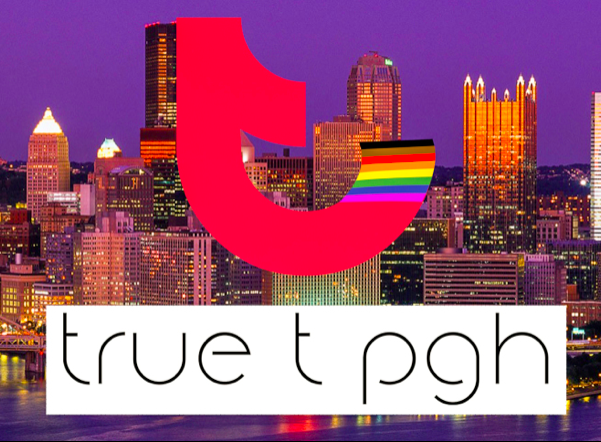 Founded in 2010 by John Easter, Duane Binion, and Dalen Hooks, True T PGH (formerly True T Entertainment) serves as a community platform for LGBTQ resource sharing, queer arts, activism, and entertainment. Through community outreach and safe space makingwe provide meaningful resources while giving back to our community. Collaboration and volunteer work hasallowed us to build budding relationships with other numerous local and regional individuals and organizations. Pittsburgh’s bright future is built on a diverse transportation network that safely connects all people to their destinations. Residents, commuters, and visitors joyfully experience our unique topography and neighborhoods while navigating the city by bike and on foot. Well-designed bikeways, walkways, and communities will make riding a bike or walking comfortable, convenient, and fun. Our embrace of an active and healthy lifestyle is reflected in Pittsburgh’s commitment to providing safe, world-class facilities for biking and walking. 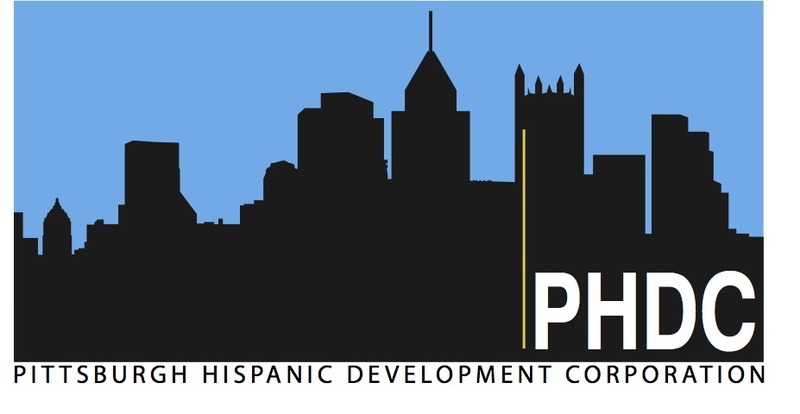 The PHDC is a community development corporation dedicated to increasing Hispanic population and investment in the Pittsburgh metropolitan area. Oakland Planning and Development Corporation is a nonprofit community development organization serving Pittsburgh’s vibrant cultural, educational and medical hub since 1980. We provide affordable rental housing, sell homes to homeowners, organize and advocate for residents, facilitate planning processes, provide workforce development and financial coaching, and help youth succeed in high school and beyond. 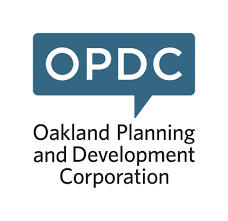 Guided by The Oakland 2025 Master Plan, OPDC’s vision is to make Oakland a beautiful, well-designed, sought-after neighborhood, in which a diverse mix of residents and visitors flourish. 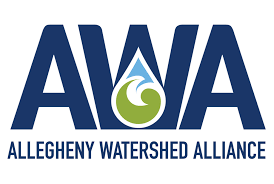 The Allegheny Watershed Alliance is dedicated to the support and development of watershed groups by leveraging technology, building capacity and creating spaces for partnerships. FracTracker, the project, was originally developed to investigate health concerns and data gaps surrounding western PA fracking. Today, as a non-profit organization, FracTracker Alliance supports groups across the United States, addressing pressing extraction-related concerns with a lens toward health effects and exposure risks on communities from oil and gas development. We provide timely and provocative data, ground-breaking analyses, maps, and other visual tools to help advocates, researchers, and the concerned public better understand the harms posed by hydrocarbon extraction. Founded in 1920, the American Civil Liberties Union (ACLU) is the nation’s foremost guardian of liberty. We are a nonprofit, nonpartisan organization dedicated to defending and protecting our individual rights and personal freedoms. Assemble is a 501(c)3 nonprofit organization dedicated to fostering learning and creativity. Assemble envisions diverse neighborhoods of empowered people who create, connect, learn, and transform together. We build confidence through making by uniting communities of artists, technologists, makers, and learners both in our space at 4824 Penn Ave and beyond. 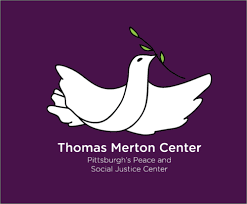 The Thomas Merton Center works to build a consciousness of values and to raise the moral questions involved in the issues of war, poverty, racism, classism, economic justice, human rights, and environmental justice. TMC engages people of diverse philosophies and faiths who find common ground in the nonviolent struggle to bring about a more peaceful and just world. We believe the best things happen when customers are satisfied. That’s why we’re always looking to exceed expectations. Our goal is to mix the perfect potion of service, quality, and pricing. We aren’t perfect, but we give it our best shot! We’re happy to print a sample before running any order. 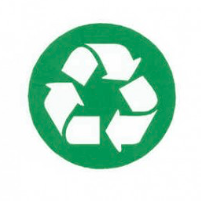 If you want to make changes to your document after a first sample, we can make another sample until it’s perfect. We want to work with you just as much as you want to work with us, let us know how we can better serve you. 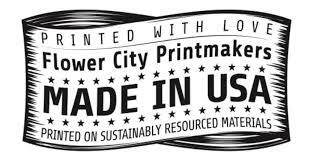 Locally owned print shop that supports and presents community events in and around the Pittsburgh Area. 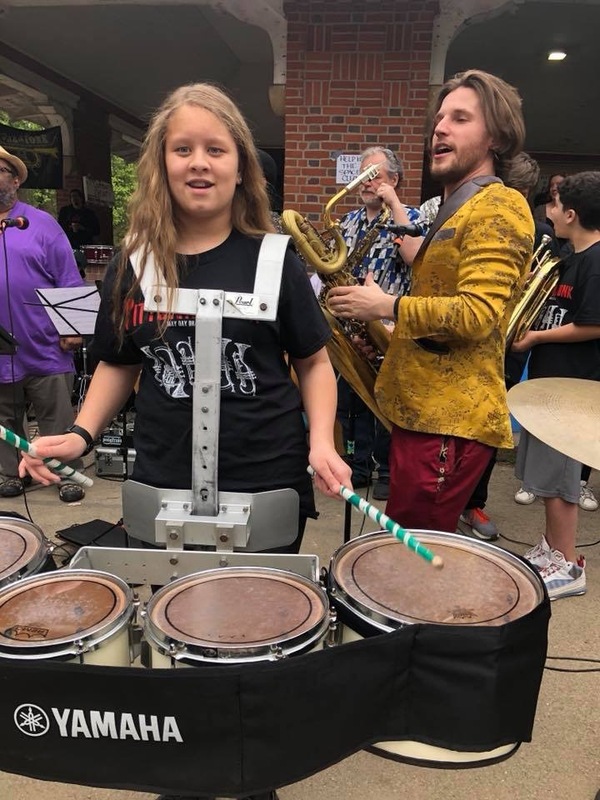 As a community group how would you want to convey your message or express what you do if you had a full band at your disposal? 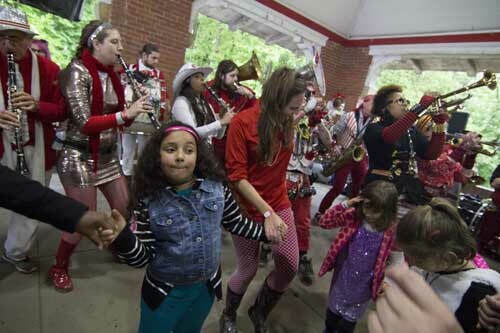 In 2018 Pittonkatonk will launch its Environmental Impact Experience that partners local non-profit organizations working on issues ranging from clean air, clean water, immigration, displacement, and social justice with local performers to create new collaborative works that will be featured at the May Day Picnic on May 5, 2018. 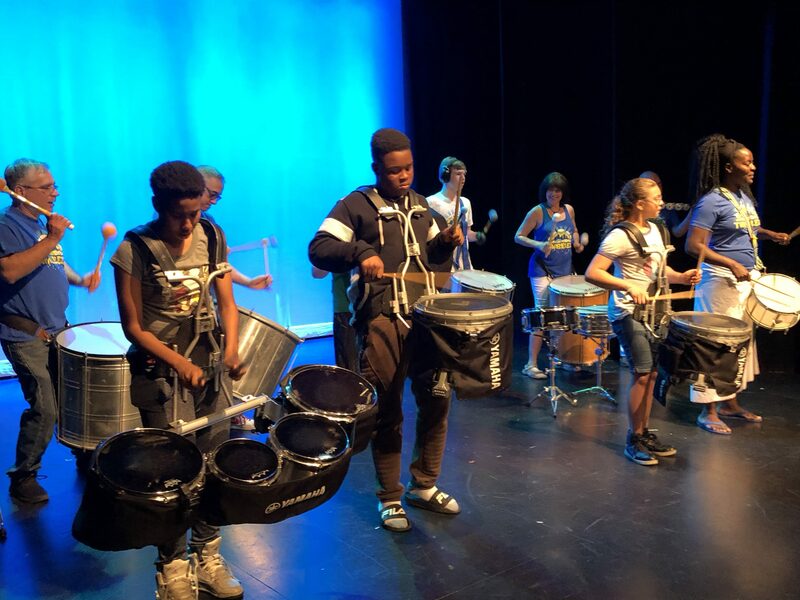 This project will connect 3 local organizations with a facilitator and band to create a performance that conveys the mission of the organization. This project will work in three ways. First initial meetings between the band, a facilitator, and the organizations to review the mission and vision. The role of the facilitator is to help brainstorm and break through the surface to help create an impactful message and performance. Second stage is rehearsal. 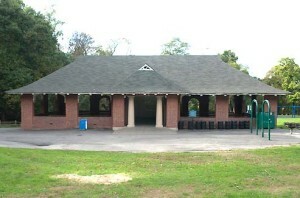 The band and organization will work together from March to May composing and rehearsing the piece. Documentation of this program will be important element. Third component is the actual performance, documentation, and audience response at Pittonkatonk. We will ask that the documentarian interview members of the performance and the audience to gauge audience response then compile this into a short video both can use for their purposes.